We have another style twin moment, and this time it involves capes. The only surprise here is that it took me this long to cover it. In November, Queen Letizia attended the National Innovation and Design Awards with King Felipe. Well, maybe it's not quite a cape. Not a capelet, not yet a cape. 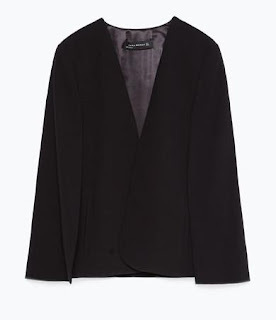 It's from Zara, and they call it a cape jacket. Anyway, Letizia paired it with a white Hugo Boss blouse with a bow at the neck and black trousers. Soon enough, we were offered another opportunity to examine this cape situation. Last week, Princess Madeleine attended the Global Child Forum with King Carl Gustaf, Queen Silvia, and Princess Sofia. And Madeleine also paired it with a blouse with a neck bow underneath and black trousers, go figure. I'm going to have to give this one to Letizia, though - the simplicity of her shirt and the wider bow really make this one work.